Wait! Don't throw out that stem from the broccoli! Yes, the stem seems tough, but that's just because you haven't peeled it! Try peeling broccoli stems and discover a crisp, mild, crunchy treat. Look for broccoli heads with fresh-cut stems. Avoid stem ends that are browning or look dried out. Ideally, you'll also be able to choose a bunch of broccoli that has fresh, vibrant-looking leaves (if the leaves have already been cut off, that's a sign that the broccoli is less than perfectly fresh—they were starting to wilt and whoever is selling it cut them off). Cut off and discard the stem end. Unless the stem is damaged, just 1/4 to 1/2 inch is probably enough. Cut or snap off any leaves. That is if you're lucky enough to have a bunch of broccoli with the leaves still attached. Many people will discard these, but know that they cook up like any winter green (get cooking green recipes here). Cut off the broccoli florets. Obviously, you're going to want to reserve these for another use—see these broccoli recipes for ideas. Now you should have just the thick, pale green broccoli stem at hand. Cut off the bottom of the broccoli stem to create a flat surface on which to stand the broccoli stem up on a flat cutting surface. You can trim the top if you like, although it tends to ends up getting trimmed off as you peel the stem. 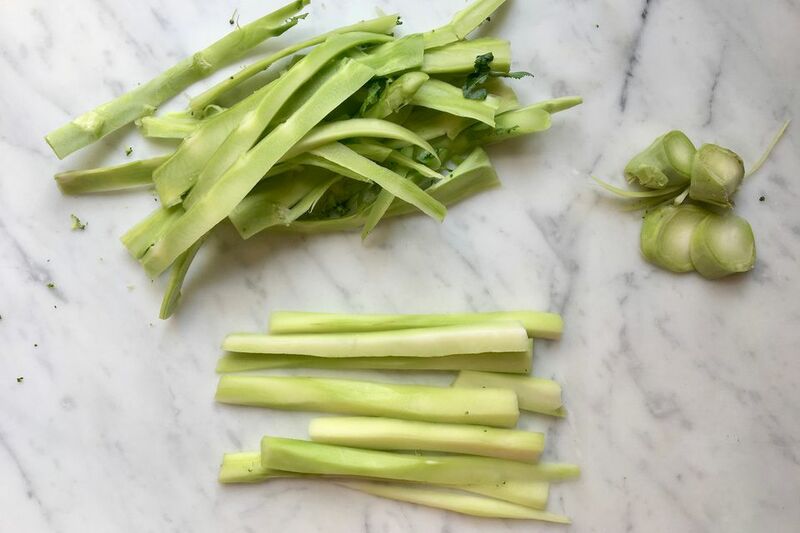 Stand the trimmed broccoli stem up on its flat end and, using a sharp knife and following the shape of the stem and the thickness of the peel, cut off and discard any and all tough exterior of the broccoli stem. In most cases, it's easy to see exactly what needs to be cut off, since the peel is a pale green that is noticeably darker than the even paler, almost white, green of the tender heart of the stem inside. 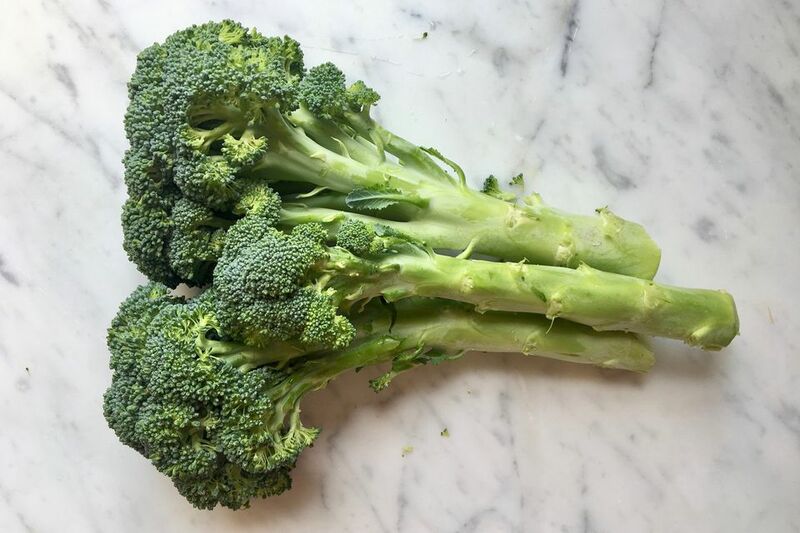 Tip: Be generous with your cuts—any bits of peel left behind will stand out as tough and unpleasant compared to the tender broccoli stem interior. It's better to sacrifice a bit of the tender inside that bite into the tough peel as you eat. Repeat around the rest of the broccoli stem. Again, be aggressive and remove any tough bits. Now you have a peeled broccoli stem ready to use. One super easy way to serve them is with a simple drizzle of soy sauce or tamari. Cut the peeled stems into sticks and serve them with a dip. Or, cut the stems on the diagonal into thin slices. Add the slices to a stir-fry (they act a lot like crunchy water chestnuts!) or simply toss them into salads. Or, julienne them (cut into thin matchsticks) and dress them all on their own as a simple slaw, perfect for tucking into sandwiches for a bit of tender crunch.